...it was not the water from the sky but the water that broke through the city's protective barriers that changed everything for the worse. With a population of nearly 500,000, New Orleans is protected from the Mississippi River and Lake Pontchartrain by levees. When the levees gave way in some critical spots, streets that were essentially dry in the hours immediately after the hurricane passed were several feet deep in water on Tuesday morning. Even downtown areas that lie on higher ground were flooded. Mayor Nagin said both city airports were under water. this way. As Eric Boehlert point out, the flooding could have been avoided if President Bush had not diverted millions of dollars from a federal program designed to build up the levees in order to pay for his tax cuts and for the war in Iraq. In 1995, Congress authorized the Southeast Louisiana Urban Flood Control Project, or SELA. Over the next 10 years, the Army Corps of Engineers, tasked with carrying out SELA, spent $430 million on shoring up levees and building pumping stations, with $50 million in local aid. Yet after 2003, the flow of federal dollars toward SELA dropped to a trickle. The Corps never tried to hide the fact that the spending pressures of the war in Iraq, as well as homeland security -- coming at the same time as federal tax cuts -- was the reason for the strain. At least nine articles in the Times-Picayune from 2004 and 2005 specifically cite the cost of Iraq as a reason for the lack of hurricane- and flood-control dollars." *" In early 2004, as the cost of the conflict in Iraq soared, President Bush proposed spending less than 20 percent of what the Corps said was needed for Lake Pontchartrain, according to a Feb. 16, 2004, article, in New Orleans CityBusiness." *" On June 8, 2004, Walter Maestri, emergency management chief for Jefferson Parish, Louisiana; told the Times-Picayune: “It appears that the money has been moved in the president’s budget to handle homeland security and the war in Iraq, and I suppose that’s the price we pay. Nobody locally is happy that the levees can’t be finished, and we are doing everything we can to make the case that this is a security issue for us.”"
*"The 2004 hurricane season was the worst in decades. In spite of that, the federal government came back this spring with the steepest reduction in hurricane and flood-control funding for New Orleans in history." *" One project that a contractor had been racing to finish this summer: a bridge and levee job right at the 17th Street Canal, site of the main breach on Monday." *"The Newhouse News Service article published Tuesday night observed, "The Louisiana congressional delegation urged Congress earlier this year to dedicate a stream of federal money to Louisiana's coast, only to be opposed by the White House....In its budget, the Bush administration proposed a significant reduction in funding for southeast Louisiana's chief hurricane protection project. Bush proposed $10.4 million, a sixth of what local officials say they need." Local officials are now saying, the article reported, that had Washington heeded their warnings about the dire need for hurricane protection, including building up levees and repairing barrier islands, "the damage might not have been nearly as bad as it turned out to be. So Bush saves a few hundred million dollars by scrimping on funding for flood protection in New Orleans and now as a result we will have to pay billions and billions of dollars in disaster relief aid. Is there no end to the blundering incompetence and short-sightedness of this administration? This is, without a doubt, the worst presidential administration this country has ever seen. B. Enter the year you graduated from high school in the search function. C. Bold for the songs you like, strike through the ones you hate and italicize your favorite. Do nothing to the ones you don't remember (or don't care about). George W. Bush is not the most unpopular president of all time, but he is getting there. Of the 12 presidents who've served since Gallup started polling in the late 1930s, Bush has entered the ranks of the most unpopular. He's now more unpopular than FDR, Ike, JFK, LBJ, Ford, and Clinton ever were, and has matched the highest disapproval rating of his idol, Ronald Reagan. • Reagan was old and amiable; Bush is young, vigorous, and has a smirk in reserve. • Both Carter and Bush 41 were one-term, rookie presidents with no clear plan to gain disfavor and who had to rely entirely on external events going south. Bush 43's chances don't depend on luck: He has a proven strategy to fail at home and abroad. • Nixon had to achieve his disapproval ratings almost entirely through scandal, with little help from the economy or world events. The Bush White House is much more versatile: They won't let scandal distract them from screwing up foreign and domestic policy. Already, 62 percent of Americans believe the country is going in the wrong direction—the highest level in a decade—even before the Bush scandals have begun to take a toll. • Truman might seem tough to beat, because Bush has no popular generals to fire. But Truman had several historic achievements under his belt that kept his unpopularity down, such as winning World War II and presiding over the postwar boom. Bush's record is free of any such ballast. In a pinch, the Bush camp can also make a good case that polling on Truman was notoriously unreliable, and that Bush deserves a share of the modern-day record if he reaches Nixon's level. With gas prices about to soar to new stratospheric highs, I imagine that Bush’s disapproval ratings will be tagging right along behind. I found a weeble in my last box of cereal that looked like a little green worm with eyes. As it turned out it was supposed to be Squirt, the young sea turtle character in Disney’s Finding Nemo movie. 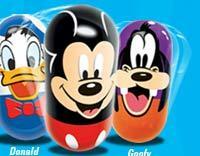 Disney has created a set of 50 of these toys they call Wobblers that they are giving away in a promotion with Kelloggs. I’m a sucker for lists and so I was facinated with how they came up with the 50 Disney characters to be represented in this collection celebrating the 50th Anniversary of the company’s theme parks. Are these supposed to be the 50 most popular characters? That seems like a lot, but there must be thousands of Disney animated characters and even with a list like this there are dozens of glaring omissions - like Cinderella and Beauty and the Beast. I’m assuming the collection was being put together before the release of The Incredibles movie which would explain their absence, but I’m still surprised that Lilo and Stitch were left out. And that’s not counting the partially animated movies like Song of the South, Pete’s Dragon, Bedknobs and Broomsticks and Mary Poppins. But who knows? Maybe they will issue a second set before long and this time include the rest of the Dwarves. A disappointing column this weekend by Jonathan Gurwitz. But have those factors changed enough to affect his position? Or perhaps he will address some of those “principled reasons” for opposing the war and explain why he is still 100 percent behind the President. Unfortunately, Gurwitz fails to address either of these issues in the rest of his column. Instead he decides to go after some easy targets - namely, some of the more extremist protesters camped out at Crawford. In this way, he manages to construct three straw men using slogans that he read off of some of the protesters’ signs and then proceeds to knock them over one by one. This also gives him an excuse to raise the specter of anti-semitism that has been exciting right-wingers recently in their efforts to smear Cindy Sheehan. But it also allows him to skirt the more serious issues facing the United States as we try to figure some way out of this quagmire Bush has led us into. Like how are we going to afford the $1 trillion price tag that this war will present us with if it continues to drag on for two or three more years. And how are we going to fill the gaps in our military as recruiting efforts continue to lag behind? I've been having a long and sometimes heated argument over at All Things Conservative about the right-wing effort to smear Cindy Sheehan as an anti-semite. It has gotten to the point where I have been accused of being an anti-semite myself because I will not condemn Sheehan as an anti-semite. "...(my son) was killed for lies and for a PNAC Neo-Con agenda to benefit Israel. My son joined the army to protect America, not Israel." There has been some question as to whether Sheehan actually wrote those words. She apparently is now claiming that her e-mail was altered and changed by somebody else who wanted to make her look bad. But assuming that she did write the above during a fit of anger, is it proof or evidence that she is racist against Jews as many on the right now allege? Another commenter at ATC insists that the above statement is "accusing Jews at the highest levels of American government of manipulating policy to get the United States to go to war to defend Israeli interests." He then goes on to claim that anyone "who can't see that this is bald anti-Semitism, consistent with right-wing extremism, Nazism, Islamic extremism and every anti-Semitic theory going back to the Protocols of the Elders of Zion," is "beyond the pale of intelligent debate." I don't agree with the statement above. I don't believe we went to war in Iraq to defend Israeli interests. But it is true that we would go to war to protect Israel if they were ever seriously threatened. And it is also true that the security of Israel was one of the factors raised by the Bush administration prior to launching their invasion of Iraq. The long-range missiles that Saddam was said to have in violation of U.N. dictates were said to be a threat to Israel - they were certainly no threat to the U.S. But even if we did go to war to protect Israel, does it mean that someone who opposes that war is necessarily racist towards Jews? To frame this question differently, I posed the following analogy: Let's say the mother of a soldier killed during the First Gulf War is angry and says she did not want her son to die defending Kuwait. Does that mean she is racist towards Kuwaitis? I for one am not happy with a lot of things that Israel does right now, but it is not because it is a Jewish state. Rather it is because they are currently guided by the right-wing Likud Party which, in my opinion, is screwing up things over there just as badly as the Republicans are screwing things up around here. The fact that I am critical of the Republicans and their political agenda does not make me anti-American. But defending Cindy Sheehan right now is not a popular thing to do at a lot of right-wing blogs. She has become a real pariah for the right and they are looking for anything they can grab to try and tear her down. But the point about Sheehan is not what her views and prescriptions are for resolving Middle East conflicts. It is simply the fact that she is there taking a stand. She is not a politician or a spokesperson for the Democratic Party. She is not a polished speaker with an army of handlers watching over her constantly to make sure she never says anything that is politically incorrect. She is just an average citizen who had the courage to stand up in the glare of the national media and say that enough is enough. In that sense, she is like Rosa Parks was for the Civil Rights movement. She is a symbol that people can rally around. It did not matter what Rosa Parks views on race relations were. Likewise, I could really care less about what Sheehan has to say on the political topics of the day. So attacking her for holding some wrongheaded ideas on certain subjects is just missing the point and shows a lack of understanding about the significance of her role in this ongoing debate. Republicans are finally starting to lose this political battle back home and that is why there has been rumbling recently that they will have a major drawback of troops next year in time for the 2006 mid-term elections. They had better do something quick because Bush's poll numbers are in total freefall right now and while he may not be running again he is going to be an albatross around his party's neck at this rate.